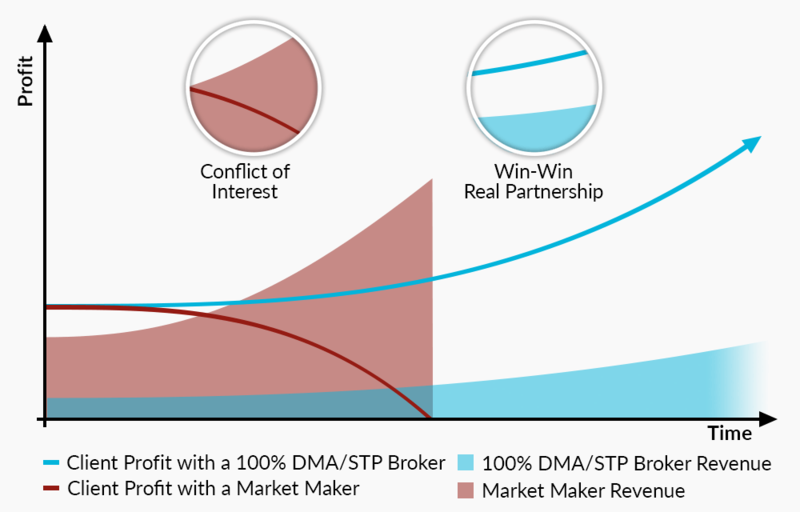 With the vast majority of FX & CFD electronic trading brokers claiming to apply a No Dealing Desk 100% DMA/STP execution model, but not actually doing so, one of the biggest challenges that traders face today is how to differentiate reality from misleading marketing promises. 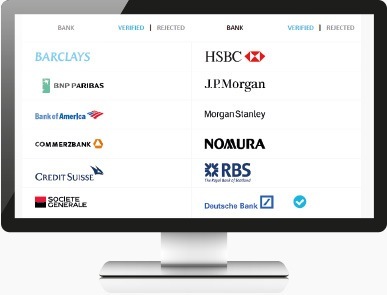 A 100% Agency model, where a broker acts only as an intermediary processing all orders to the interbank or exchange market, with no right to deal on their own desk, has been proven to be a superior choice for sophisticated retail investors. But, the only way to prove that you are trading with a 100% DMA/STP broker is with authentic Post-Trade Transparency! Only if a broker is able to provide traders with such details, can you be sure that it is running an ethical business protecting your interests. WHY IS POST-TRADE TRANSPARENCY IMPORTANT? Because your Post-Trade Transparent broker will earn only from commissions charged on the traded volume, not from your losses! There is no conflict of interest, as it is in their interest to keep you happy; the longer you remain profitable, the longer you will keep using the broker's services, paying them the respective commissions. As a client with a live trading account, you have the right to know how and by whom your orders are executed. Feel free to ask your broker for this information. There is nothing that should stop your broker to disclose such details unless they are hiding something. If you receive a negative answer, consider it as a serious alert that the broker is trading against you, keeping in-house all or part of your orders (especially the losing positions). If your broker lacks the desired level of Post-Trade Transparency, stop wasting time and money trading with them! There is no reason to continue being exposed to bad practices like stop hunting, forced slippage, delayed execution and re-quoting. AT JFD, WE PROVIDE ALL DETAILS UPON REQUEST, TO ALL CLIENTS, WITH NO DISCRIMINATION WHATSOEVER. YOUR TRADING WON'T GET BETTER BY CHANCE IT WILL GET BETTER BY CHANGE! 100% DMA/STP Agency Model with 1 account & 1 pricing for all clients. 100% trade anonymity (LPs never see stops, limits & entry orders). Access to all markets: 9 asset classes and 1500+ instruments. 100% Post-Trade Transparency - MiFID II compliant, ultra-fast execution (millisecond latency with 0% rejection rate & no requotes) .“Fill or Fill” model (negative and positive slippage enabled). Cutting-edge IT technology, hosted at Equinix NY4 & LD4. Performance optimised servers, cross-connected to ECN/Banks. High capacity aggregation, smart order routing & bridging. Core interbank spreads from 0 pip for ALL clients (0.1 pip EUR/USD weekly avg. London session). Reduced commissions of 60% on CFDs (0.1 per lot per side). 20+ LPs (Tier1 Banks, Non-Bank LPs and MTFs) ensures best pricing. Equal conditions for ALL clients (from € 500 initial deposit). Access to multiple platforms (MT4+ and Guidants) via one single account. Safety of client funds (CySEC, Bundesanstalt für Finanzdienstleistungsaufsicht (BaFin), FCA, ACPR, MiFID II & ICF). JFD’s multi-asset class research for all types of traders. 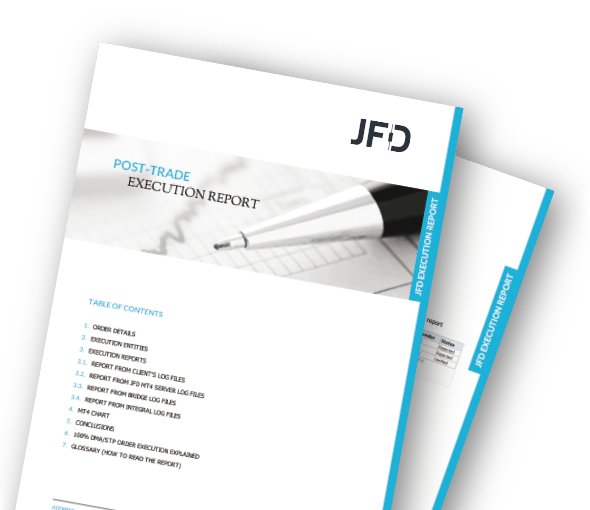 Professional technical & fundamental analysis, published on our JFD Research site and worldwide. Winner of ‘Best FX & CFD Research 2015’. TAKE ADVANTAGE OF ALL THAT JFD HAS TO OFFER! We take action on our promises to deliver game-changing innovations, gaining global recognition in the process and winning numerous awards for our exceptional contributions to the industry. For providing our sophisticated clients with the most trader-centric and comprehensive solution suite available in the marketplace, JFD has been already ranked among the Top 3 Largest MT4 Brokers worldwide and is listed in the World Finance 100 Companies.